Now offering Pilates, Qigong, Private Yoga and Personal Training sessions! Watch our two-minute video and learn about Kūr and what makes us different from our Ayurvedic treatments to yoga. A special client testimonial too! 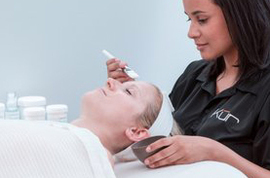 ﻿Kūr Wellness Studios provides a full menu of massage, skin care and waxing services with a unique yoga studio. A new and different wellness center, Kūr offers more than 100 traditional and Ayurvedic treatments and services, and variety of yoga classes and workshops.